The oil markets were rocked by the news that OPEC will be maintaining its oil output level at 30 million barrels per day. "No change," was the response from Kuwait's oil minister when asked about OPEC's decision on oil production. With that, the cartel has decided to keep its oil production target at a ceiling of 30 million barrels per day. While it is a decision many had come to expect, as the oil cartel has been hinting recently that it can withstand lower oil prices, that doesn't mean the news isn't sending big waves through the oil markets. Despite a rapid deterioration in the price of oil over the past few months, OPEC is holding firm even as some in its ranks have been deeply affected by the slide in oil prices. Venezuela, for one, is having a tough time as its finances are deteriorating, which is why it had pushed hard for a cut in production to boost the price of oil. However, that cut would've needed to have been deep as it's estimated that OPEC would have needed to take 1 to 1.5 million barrels of oil offline in order to reduce the imbalance between supply and demand. However, the real issue OPEC sees is the fact that the current oversupply in the oil markets is not of its making. And because of this, it doesn't believe it should have to be the one making the sacrifices to get oil prices lower. Instead, it's hoping to shake out some of the weaker links within the oil market so it can maintain control. So, how did supply and demand get so out of whack? OPEC's decision to maintain its current oil production ceiling is coming at a time when one of its largest customers no longer needs as much of its oil. As the following chart shows, American oil imports from OPEC have dropped precipitously over the past five years. OPEC Crude Oil Production data by YCharts. 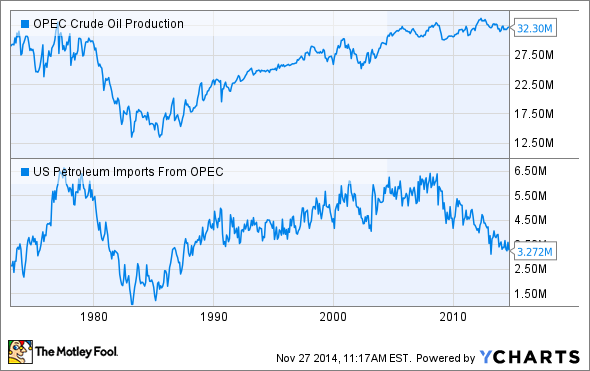 There are three driving factors leading to America needing less oil from OPEC. First, a combination of high gas prices and demographic changes has Americans driving less at a time when our vehicles are becoming more fuel efficient. This is easing American demand for oil. The second and third factors both relate to new oil technologies that have unlocked vast supplies of oil in North America. We've seen Canada figure out how to profitably produce oil from its massive oil sands reserves at the same time American oil companies have unlocked the oil that had long been trapped in tight shale formations. Above all else, the shale boom has been the real game-changer for the oil industry, as it is driving a remarkably quick jump in U.S. oil production, evidenced in the following chart. It's this U.S. production OPEC sees as a real threat to its control of the oil market. If OPEC cut its production, this would only fuel greater development of U.S. oil supplies, which are currently costlier to develop. So, by keeping its output steady, OPEC is hoping to keep a lid on American oil output, as it knows U.S. producers will have no choice but to cut investments as prices grow weaker. That being said, American oil producers can still make plenty of money even as oil prices weaken. Producers have made a lot of progress on getting costs down by developing new technologies to extract more oil out of shale plays per dollar spent. Because of this, some companies can still earn adequate returns even if oil fell below $40 per barrel. Clearly, the U.S. shale boom is having an impact on OPEC's policies. While the cartel is standing firm on production, some of its members are really hurting, so it will be interesting to see how long it can withstand these lower oil prices. However, OPEC is hoping this pain will spread to American shale producers and force them to cut investments while pushing weaker producers out of business. It's an aggressive plan to endure some pain now in an effort to stifle its newest rival. That said, American producers should be able to adapt to lower prices as the cost of shale production has been rapidly declining over the past couple of years, suggesting that while shale growth will slow, it's unlikely to be stopped.